The thermal relaxation of macrospins in a strongly interacting thin film of spinel-phase iron oxide nanocrystals (NCs) is probed by vibrating sample magnetometry (VSM). Thin films are fabricated by depositing FeO/Fe3O4 core–shell NCs by electrophoretic deposition (EPD), followed by sintering at 400°C. Sintering transforms the core–shell structure to a uniform spinel phase, which effectively increases the magnetic moment per NC. Atomic force microscopy (AFM) confirms a large packing density and a reduced inter-particle separation in comparison with colloidal assemblies. At an applied field of 25 Oe, the superparamagnetic blocking temperature is T B SP ≈ 348 K, which is much larger than the Néel-Brown approximation of T B SP ≈ 210 K. The enhanced value of T B SP is attributed to strong dipole–dipole interactions and local exchange coupling between NCs. The field dependence of the blocking temperature, T B SP(H), is characterized by a monotonically decreasing function, which is in agreement with recent theoretical models of interacting macrospins. The thermally activated spin relaxation of ferromagnetic (FM) nanocrystals (NCs) continues to be of interest in applied physics because of its relevance to the design of magnetic storage media and spin transport devices [1–3]. According to the Stoner–Wohlfarth model, rotation of the macrospin from one energy minimum to another depends upon the uniaxial anisotropy barrier, which scales with the NC volume . Consequently, the relaxation of an isolated macrospin is governed by the competition between the thermal energy and the uniaxial anisotropy energy. Deviations from this simple model can result from numerous factors, such as contributions from surface anisotropy [5–7], interaction with an antiferromagnet [8–10] or a surface spin glass phase , or dipole–dipole interactions [12, 13]. Measurement of the temperature-dependent magnetization, m(T), is a useful procedure for probing the relaxation dynamics, since it determines the transition temperature separating the thermally stable state and the superparamagnetic state (T B SP). 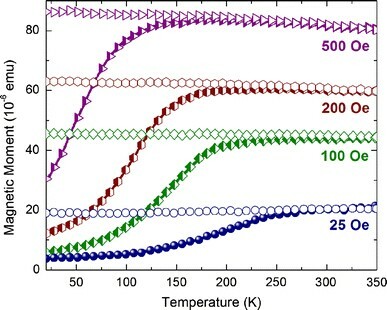 Furthermore, measurement of the field dependence of the transition temperature, T B SP(H), provides additional information concerning the effect of collective phenomena on the thermal relaxation of interacting macrospins. Recent examples of collective phenomena are the flux-closure [14, 15] and super-spin-glass (SSG) states [16–18]. Considerable deviation from the single-particle approximation of thermally activated spin relaxation is expected to occur in coupled systems exhibiting either cooperative or frustrated behavior. In this article, we report on the field dependence of the superparamagnetic transition in a strongly interacting thin film of spinel-phase iron oxide NCs. The field dependence is probed by a combination of zero-field-cooled (ZFC) and field-cooled (FC) measurements via vibrating sample magnetometry (VSM). Thin films are fabricated by a combination of electrophoretic deposition (EPD) and sintering. EPD is a facile tool for producing disordered thin films of strongly interacting colloidal NCs. Sintering the films removes the organic ligand molecules that coat each NC, yielding a system that maximizes dipole–dipole interactions and local exchange coupling between contacting surface spins. Surface anisotropy is not the main factor governing the relaxation dynamics for this system; however, its contribution to the effective anisotropy constant is taken into account. Additionally, the NCs consist of a continuous ferrimagnetic (FIM) spinel phase, which rules out significant interfacial coupling, such as exchange bias and exchange spring phenomena. In the strongly interacting system considered here, the relaxation of macrospins is governed primarily by the competition among the magnetic anisotropy, dipole–dipole interactions, exchange coupling, and thermal energy. FeO/Fe3O4 core–shell NCs are synthesized by the thermal decomposition of an iron oleate precursor in the presence of oleic acid. The iron oleate is prepared by reacting 2.17 g of FeCl3·6H2O with 7.3 g of sodium oleate in a mixture of ethanol, deionized water, and hexane at 70°C under rapid stirring. Hexane is removed by additional heat treatment at 75°C under vacuum for 24 h. Decomposition of the iron oleate in a mixture of 1-octadecene and oleic acid produces 14-nm FeO NCs, which oxidize to singly inverted FeO/Fe3O4 core–shell NCs upon exposure to air . 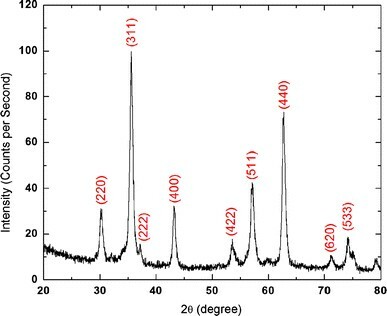 X-ray diffractometry (XRD) and absorption measurements, described extensively in a previous publication, confirm the composition and singly inverted structure . Transmission electron microscopy (TEM) images of the FeO/Fe3O4 core–shell NCs are provided in Fig. 1a and 1b. According to Fig. 1a, the NCs have an average diameter of D ≈ 14 nm and a narrow size distribution that results in ordered assemblies upon evaporation from toluene. Dilute assemblies of spinel NCs on Si3N4 membranes are fabricated via a combination of evaporation and sintering of the FeO/Fe3O4 core–shell NCs at 400°C under nitrogen flow. Sintering under nitrogen is expected to convert FeO to a dominant phase of Fe3O4. A TEM image of the sintered NCs is provided in Fig. 1c. The average surface-to-surface separation between NCs decreases significantly in comparison with the colloidal assemblies depicted in Fig. 1a and 1b. XRD of the sintered NCs is provided in Fig. 2. The diffraction peaks correspond to the spinel phase of iron oxide, which can include γ-Fe2O3 or Fe3O4. Given the stoichiometry of our original core/shell NCs and the absorption properties of these materials, cited elsewhere , we conclude that our NCs are Fe3O4. Thin films of core–shell NCs are fabricated via EPD, a process in which a DC electric field drives charged NCs in suspension toward field-emanating electrodes, resulting in a disordered assembly [21, 22]. Silicon substrates (p-type and n-type) with a native surface oxide layer are arranged in a parallel-plate configuration, with a separation of 2.4 mm, and act as the electrodes. The dimensions of the electrodes are ~1 cm × 2 cm. Thin films are formed upon submerging the silicon electrodes into an NC suspension with an applied voltage of 500 V. Deposition is allowed to progress for thirty minutes, followed by the removal of the electrodes from suspension, yielding a thin film of core–shell NCs. Sintering the films at 400°C removes the organic ligand layer that coats each particle and transforms the core–shell structure of each NC to a continuous spinel phase of iron oxide, as evidenced in Figs. 1c and 2. The surface structure of the thin films is probed by atomic force microscopy (AFM) using a Digital Instruments Nanoscope III operating in tapping mode. 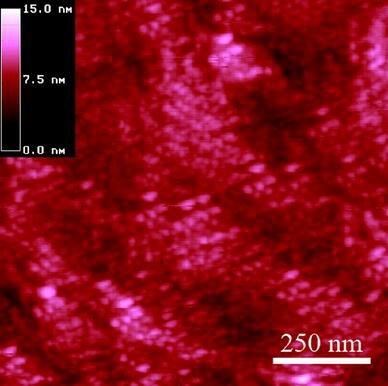 An AFM image of the iron oxide NC film on p-type silicon is provided in Fig. 3. The scanning area is 1 μm × 1 μm. Although AFM probes local regions of the film, scans of different areas exhibit a similar surface structure. Surface analysis yields a root mean square roughness of 1.3 nm. According to the figure, the film is characterized by a densely packed, disordered assembly of single-domain NCs. The average size and shape of the NCs is in agreement with the results obtained from TEM. The surface-to-surface separation between NCs is smaller than is typically observed in colloidal assemblies, where the distance between NCs is governed by the length of the organic capping molecules (δ ≈ 1–2 nm). Therefore, it is reasonable to presume that the magnetic properties of the NCs are governed by collective effects rather than by single-particle approximations. In order to estimate the dipole–dipole interaction strength and its corresponding effect on the thermally activated relaxation dynamics, the magnetic moment per macrospin is measured by VSM. The ZFC hysteresis loops of a powder sample of spinel NCs are provided in Fig. 4. Data acquisition is achieved by cooling the sample in zero applied field and, then, cycling the applied field at a constant temperature. The saturation magnetization is M S ≈ 67 emu/g at 50 K and M S ≈ 63 emu/g at 300 K. The magnetic moment per NC is calculated from the relation μ = M sρV, where ρ is the density of magnetite, and V is the average particle volume. Taking M s ≈ 63 emu/g at 300 K and ρ = 5.175 g/cm3, the magnetic moment per NC is ~4.7 × 10−19 A m2 or 50,520 μB. For the iron oxide films fabricated by EPD, the minimum center-to-center separation between NCs is approximately a single particle diameter, since the organic surfactant is removed after sintering. Assuming this separation, for a pair of macrospins arranged in a head-to-tail configuration, the upper bound of the dipole–dipole energy is estimated to be E D ≈ 100 meV. This can be compared to the magnetic anisotropy of an isolated NC, which is given by E A = K U V. Using K U ≈ 5 × 104 J/m3, which includes the effect of surface anisotropy, the uniaxial anisotropy barrier for a 14-nm spinel cluster is E A ≈ 450 meV . Ordered monolayers of Fe3O4 NCs with a pair-wise magnetic dipole–dipole energy exceeding k B T at room temperature are reported as displaying flux-closure arrangements of macrospins in zero applied field . Additionally, SSG behavior has been reported below the critical freezing temperature of T f ≈ 30 K in a system of ~5-nm Fe3O4 NCs . It is possible that either a flux-closure or SSG state exists at low temperature for the electrophoretically deposited films fabricated according to the procedure outlined in section “Experimental”, since the dipole–dipole energy is greater than k B T at room temperature and on the same order of magnitude as the anisotropy energy. 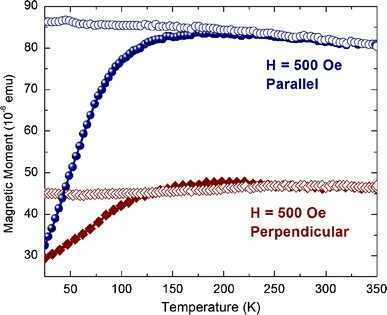 Dipole–dipole interactions in the iron oxide film are verified by probing the temperature-dependent magnetization for orthogonally applied magnetic fields. Figure 5 illustrates the ZFC/FC magnetization for magnetic fields applied parallel and perpendicular to the film surface. ZFC measurements are obtained by cooling the sample to 20 K in zero field. A small field is then applied at 20 K, and the magnetization is recorded as the sample warms to 350 K. The procedure for the FC measurement is similar, except the sample is cooled in the presence of a small external field. For the ZFC data, the magnetic moment rises more rapidly and attains a greater maximum value for the field applied parallel to the film surface. This implies an easy magnetization axis in the plane of the film as opposed to perpendicular to the surface. Hence, a significant magnetization anisotropy due to the geometry of the film exists that can be approximated by , where t is the film thickness . Thin film geometries typically display an in-plane easy magnetization axis when the saturation magnetization and the film thickness are sufficient in magnitude so that said anisotropy dominates other forms of anisotropy (i.e., surface and magnetocrystalline). Therefore, the difference in the magnetization, observed in-plane versus perpendicular to the iron oxide nanocrystal film, must dominate the anisotropy barriers of the individual NCs. Another interesting aspect of Fig. 5 involves the superparamagnetic transition temperature, T B SP, which is defined as the maximum in the ZFC data and depends on the time scale of the measurement. Note that VSM measures the temperature at which the macrospins relax on the order of τ ≈ 100 s . As depicted in Fig. 5 T B SP ≈ 190 K for the parallel applied field, while T B SP ≈ 217 K for the perpendicular applied field. The thermal relaxation of the iron oxide film is further probed by the ZFC/FC measurement of m(T) for parallel applied fields ranging from 25 to 500 Oe. A plot of the data is provided in Fig. 6. According to the figure, the thin film exhibits a superparamagnetic blocking temperature of T B SP ≈ 348 K at 25 Oe. 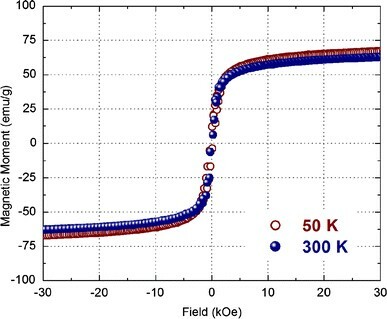 In contrast, the Néel-Brown model of thermally activated spin relaxation predicts a blocking temperature of T B SP = 210 K for a 14-nm iron oxide cluster [27, 28]. The enhanced value of T B SP with respect to the isolated particle approximation is primarily attributed to strong dipole–dipole interactions and local exchange coupling between contacting NCs . Since E D >k B T at room temperature, the dipole field emanating from an NC can easily polarize neighboring macrospins, which delays the transition to the superparamagnetic state. In addition to delaying superparamagnetism with respect to the time scale of the measurement, dipole–dipole interactions can affect the distribution in energy barriers that are responsible for mediating spin reorientation. Looking at Fig. 6, the peaks in m(T) are extremely broad for all values of the applied field, indicating a gradual transition to the superparamagnetic state. This is in contrast to weakly interacting systems of monodisperse FM NCs that display a sharper transition from the blocked state to the superparamagnetic state . 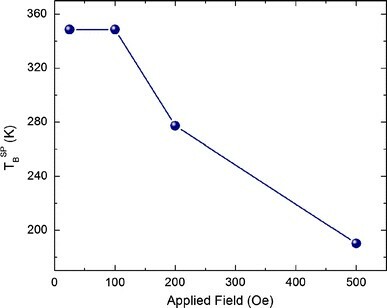 Figure 6 also indicates a decrease in the value of T B SP as the applied field is increased to 100, 200, and 500 Oe. Hence, the effective barriers to spin reorientation are lowered for larger applied field strengths. According to Fig. 7, T B SP(H) displays a non-linear decrease with an increase in the applied field. This is in qualitative agreement with the theoretical model of the ZFC magnetization of weakly interacting nanoparticle assemblies proposed by Azeggagh and Kachkachi . They show that within a Gittleman–Abeles–Bozowski (GAB) model, the form of T B SP(H) is dependent upon the particle concentration and, therefore, on the strength of the dipole–dipole interactions. More specifically, T B SP(H) is predicted to be a non-monotonic, bell-like function for non-interacting systems, as opposed to a monotonically decreasing function for weakly interacting systems. Figure 7 indicates that T B SP(H) is a monotonically decreasing function, as expected for a system of interacting macrospins. Experimental measurements of dilute systems also have confirmed the predictions of the GAB model. For example, Sappey et al. report a non-monotonic dependence of T B SP on the applied magnetic field for a dilute ensemble of γ-Fe2O3 NCs embedded in a silica matrix. Therefore, the model is in qualitative agreement with experimental measurements of both non-interacting systems and the strongly interacting system investigated in this article. In summary, we have investigated a strongly interacting assembly of iron oxide NCs fabricated by a combination of EPD and sintering. Characterization by AFM indicates a densely packed, disordered assembly. VSM measurements confirm an in-plane easy magnetization axis as a consequence of significant dipole–dipole interactions. The thermally activated spin relaxation is investigated by the ZFC/FC measurement of the temperature-dependent magnetization. Particle interactions are found to have two main effects on the relaxation dynamics: (1) an increase in the energy barrier distribution and (2) a decrease in the effective barriers to spin reorientation with an increase in the applied field. These results are in qualitative agreement with recent theoretical models, which predict that T B SP(H) is a monotonically decreasing function for interacting systems. This work was funded by NNSA DE-FG 52-06NA26193, NHMFL-IHRP, NSF DMR-0084173, and the State of Florida.